It works. Wow does it work! Went to the campus wood shop after class to cut the aluminum plates for the amplifier’s cabinet. It took several hours of cutting, filing, and drilling to create the three plates making up the bottom, the back, and the switch and fuse panel. However, it was worth it. 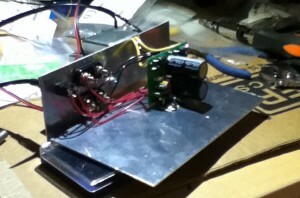 With the plates fabricated, I had a basic chassis to attach the amplifier and its many support parts to. I’ve been at it since marching band class ended 9:30 last night. Only finished it within the last hour. While the MAKE Magazine article suggested connecting a dummy load first and measuring the voltage across it, I could not get that to work. Instead, I jumped right into it and connected the amp to the speakers left over from my old boom box. I was greeted by a 440Hz sine wave coming out of Pure Data. I quickly moved on to a more “entertaining” test. Wow. Just wow. Ross Hershberger wasn’t lying when he said this thing sounds like a million bucks. It’s just like listening to my dad’s 600W behemoth of a stereo back at home. If I closed my eyes, I could imagine myself front and center at an ELO concert, afros bobbing in time to “Latitude 88 North”. This amplifier is well worth the pain. Unfortunately, my joy is tempered somewhat by two things. First off, I still don’t have a cabinet, and the amp takes up a fair bit of space on my work bench. Second, when there is no input signal, there is a bit of a low hum. It’s going to get old fast, and I don’t think I have the skills or know how to track down the source of the hum myself, but just having great sounding music in my dorm again more than makes up for it. Have you built your own Bare Bones Amp? Maybe you have some insight into my noise problem. Feel free to post your comments and suggestions below. EDIT: Just found one potential source of interference. I think the amplifiers may be creating a ground loop (a path in which two ends of a grounded node come back to each other). The mounting hardware I ordered to heat sink the ICs came with metal rather than nylon nuts and bolts. I figured it would be okay, however, because the kit also included a plastic washer that fits within the IC’s mounting holes, which I assumed was to keep the bolts from making contact with the IC chassis. Turns out the washer is doing bupkis. I’ll order some nylon hardware later this week and hope for the best. If you know any other reasons for the noise, however, by all means share. This may not be the only problem with my design. Also, I found out why my initial tests failed: I had my voltohm meter set for amps instead of volts. Stupid. I finally had some time this weekend to work on the amplifier board, and for your viewing pleasure, I recorded it with my iPod Touch. It took a little less than 45 minutes to populate the board, but I sped up the video so you can see it completed in 4. In building the circuit, however, I encountered a few errors that I will want to rectify in future versions of the board, should I decide to build another amplifier. One or two of the components are a little too close for comfort. At least two capacitors are in direct contact with each other, and two resistors have their solder pads close enough that an unskilled individual could easily bridge the gap. Also, I haven’t been able to test the circuit just yet. The idea of having a live 110V AC line exposed on my workbench makes me more than a little unsettled. It appears I will not be able to test the circuit until I have a cabinet I can store it in. Despite this, I’m quite proud of how the board came out. I am one step closer to having a working stereo once again.